Posted on October 31, 2016 | 4958 views | Topic : Property News, Quick Reads. BÖN Estates obtained financing facilities to boost the development of The Estate. From left: BÖN Estates, project director Liew Kok Earn and managing director Goh Soo Sing, Maybank Bhd head of community financial services Datuk Hamirullah bin Boorhan and managing director of business banking Datuk Henry Goh Jiok Vui. 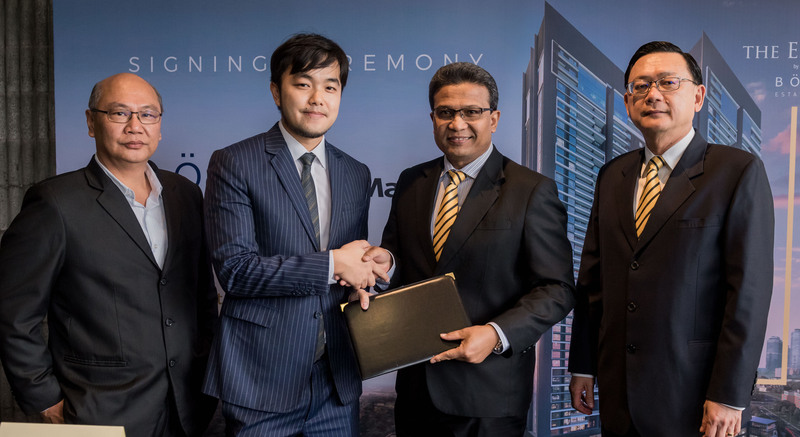 KUALA LUMPUR: A signing ceremony between BÖN Estates Sdn Bhd and Maybank Bhd was recently held to officiate the RM300mil banking facilities extended to BÖN Estate for its flagship development in Bangar South, namely The Estate. The signing ceremony was officiated by Maybank Bhd head of community financial services Datuk Hamirullah bin Boorhan, Maybank Bhd managing director of business banking Datuk Henry Goh Jiuk Vui, BÖN Estates managing director Goh Soo Sing and BÖN Estates project director Lieu Kok Earn. “BÖN Estates is very pleased to receive the support from Maybank Bhd with this loan facility. We hope that their confidence in our flagship development reflects our capabilities and the high potential that The Estates will bring,” said Goh. As the company’s flagship development, The Estate is designed to demonstrate BÖN Estates tagline, “Living, well-crafted”, through sustainable value-creation for owners. Building materials are not only carefully selected to be long-lasting, but compiles with the energy-efficient design in collaboration with the Building Sector Energy Efficiency Project (BSEEP), a national project established by the United Nations Development Programme (UNDP) and the Public Works Department of Malaysia (JKR). This includes incorporating energy optimisation with Low E windows, shading devices, LED lighting and inverter air-conditioning. “We are impressed with the BÖN Estates’ vision to create homes that are built to last. Their attention to detail in value creation will be beneficial to the growing community residing within Bangsar South and we are indeed happy to support them,” said Datuk Hamirullah. Spreads across a 3.68-acre of freehold land, The Estate comprises of two 46-storey towers with 328 condominium units, complete with a private lift lobby and four car parks. It has a gross development value (GDV) of RM650mil and boasts a “100-year home” concept that targets those who are looking for bigger residences with sustainable appreciation. The Estate offers 10 different layouts with built-up areas ranging between 2,346 sq ft and 7,057 sq ft. The design is centred around the natural landscape and built using energy-efficient and long-lasting building materials, with all units designed as a corner unit to provide breathtaking views overlooking the city or the lush Bukit Gasing forest reserve. “We aim to capitalise on our strength in value creation, not just for the company, but also for our customer. Our strategies are based on extensive research and analysis, which remains to offer high quality projects at competitive pricing in a strategic location. Well-crafted design, layout and facilities are all key factors in brining new meaning to good living,” said Goh. The Estate, which is scheduled to launch this December has already secured interest among buyers, with registration reaching 50%, solely through private previews held at the BÖN Estates’ three-storey show gallery on Jalan Maarof, Bangsar. The show gallery offers unconventional viewing experience, where guests are lead through a four-point immersive walkthrough complete with a ‘touch and feel’ of the building materials promised in the development. The Estate is currently open for private viewing at the BÖN Estates show gallery by registration and invitation only. Founded in 2009, BÖN Estates Sdn Bhd (formerly known as PPM Realty Sdn Bhd) is a boutique developer with a strong focus in building smart, value-driven and well-designed homes. The word BÖN has its roots in the Tibetan language, which alludes to the five elements of living: earth, fire, water, metal and wood. All these elements are purposefully designed into every BÖN Estates’ project as a reminder to create living spaces that exudes balance. BÖN Estates aims to differentiate itself by brining sustainable value creation to investors and owners, whether it is through the use of long-lasting building materials, energy-efficient design and management or curated experiences and residents. Since its inception, BÖN Estates has completed two projects in Peang, namely Minden Gardens, a 94-unit residential development that comprises of terrace and semi-detached homes; and White Lily, a 73-unit freehold three-storey terrace homes that occupies a gated community within Minden Gardens.